The Toshiba dynabook Qosmio T851/D8CR, announced on Wednesday, not only lets you view 3D without glasses, it can also display 2D--at the exact same time--in another window on the 15.6-inch screen. This multi-dimensional viewing is a first in laptop technology, and works by sending separate images to each eye, as well as facial tracking via the webcam. Toshiba's been very active in the glasses-free 3D scene, with prototypes for both a glasses-free laptop and glasses-free 3D 65-inch TV drawing a lot of gazes at CES 2011. 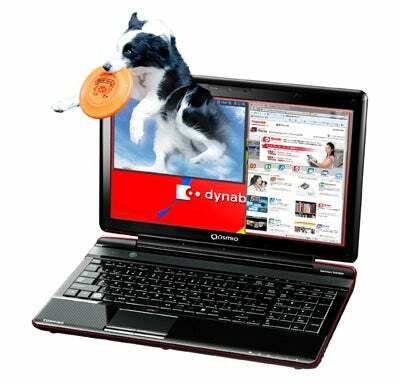 With the dynabook Qosmio T851/D8CR, Toshiba's continuing its 3D obsession and innovation, featuring real-time 2D to 3D conversion in addition to the glasses-free 3D technology and the "Active Lens" technology that allows individual parts of the LED panel display 3D. Besides letting users multi-task in different dimensions, the Qosmio T851 will feature a second-generation Core i5-2410M processor, Nvidia GeForce GT540M, Blu-ray player, a 750GB hard drive, harman/kardon speakers, and up to 8GB of RAM. There's no word on pricing yet, but shipping will begin first in Japan in late July. Stay tuned for whether watching 2D and 3D at the same time is multimedia magic or miss.